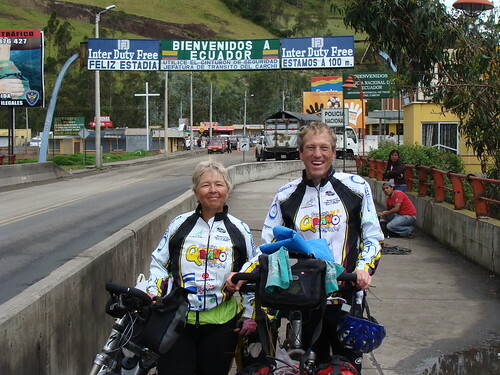 We crossed into Ecuador today! Our 10th country. 11,000 miles (17,700 km) into the ride. It's high, cold, mountainous. In the last few days we've been riding up to and above 10,000 feet in elevation and it's been so cloudy or foggy that we can't see much at all of the beautiful scenery above us. We can usually see valleys below, but can't see even the sides of the great volcanoes.